An officer found the assailant a few blocks away, on Constance near St. Andrew Street, where he was trying to take a cellphone from a 47-year-old man, the NOPD report states. When the officer approached him, police said, he tried to take the officer’s firearm. Both fell the ground, and the assailant fled. 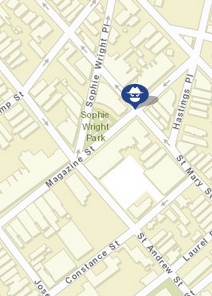 Hughes was later apprehended at Jackson Avenue and Constance Street. Anyone with information about this incident is asked to call the Sixth District at 504-658-6060.